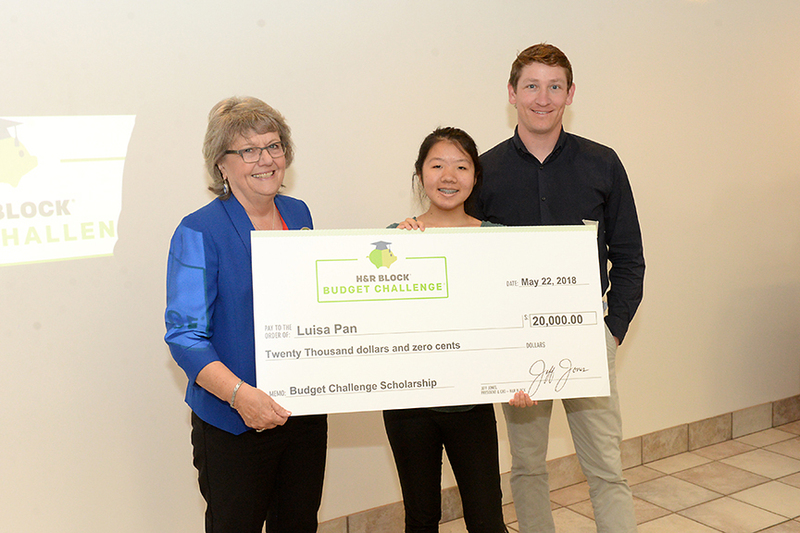 Freshman Luisa Pan’s college account got a big boost from a $20,000 scholarship from H&R Block for winning the H&R Block Budget Challenge! Two other Harker students have won this award: Roma Gandhi, grade 10, in 2017 and Rithvik Panchapakesan, grade 11, in 2016. Each semester, five awards are given out nationwide. H&R Block sent a representative to Harker today to award the check to Pan. She did have to make special time to manage the challenge. “I managed to reserve a short period of time every day before going to sleep to check that all my checks had gone through, and I was following my budget plan,” she said. “Over the weekends, I had more time to properly plan my budget for the following week. “I still have more to learn in terms of financial literacy and budgeting. I would most likely want to continue expanding my budgeting and decision-making skills.